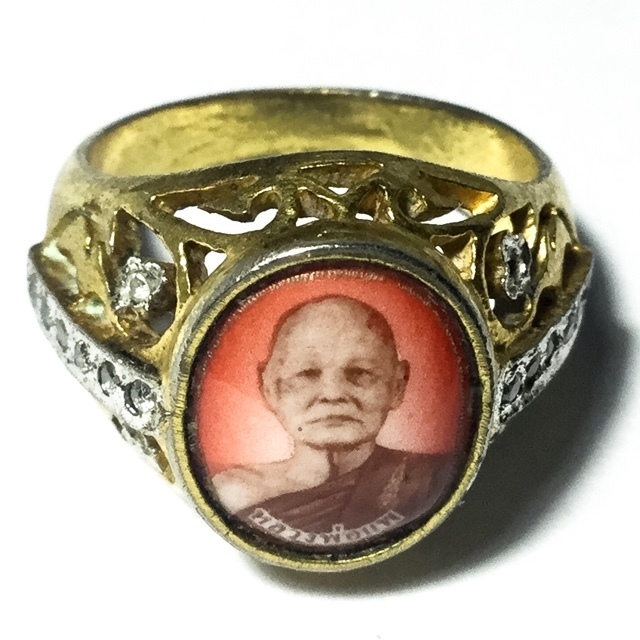 Sacred Blesséd Ring with Locket inserted into the head of ring, with rhinestones, cast in Nuea Tong Dork Buab (sacred brass alloy), from Singhburi Master Monk Luang Por Pae, of Wat Pikul Tong. The ring has a small locket inserted into the head of the ring, which has decorative sides with rhinestone inserts. The ring measures 1.7 Cm inner diameter, which would fit on the little finger or ring finger of a lady's hand or the small finger of a man's hand. Luang Por Pae was renowned for his purity of practice, and his Pra Somdej amulets, are amongst the most classic and sought after to be found in the modern era. The amulets of this great master, have been seen to dwindle from the public amulet markets, which is due to the fact that not only Thai people have been revering and holding his Amulets, rather, that devotees around the whole wide world have been snapping them up for decades now. Even as far as western world, people have been collecting his Amulets like treasure, that is becoming ever more difficult to find. This has resulted in an accelerated depletion of his Amulets over the last decade or so. Luang Por Pae amulets are highly revered and valued for their blessed empowerment by a monk with true purity of practice. Highly recommended for their eternal annd indestructible object of faith, whose purity and practice until his dying day, means that all of his amulets, will remain forever worthy of reverence. For Devotees of Luang Por Pae, and especially avid collectors, this exhibit when added to any serious Luang Por Pae amulet collection, would easily stand out above others for its inclusion. A sure bet with this amulet for authentic Luang Por Pae Wat Pikul Tong Devotees, and Collectors to enhance and complete their collection with, and for wearing and Bucha to an amulet of the Highest Sacred Value, from an Arya Sangha Guru Monk of Immense Purity and Diligent Practice, with Royal decree Status and World Famous reputation.